Happier patients—your patients want all their treatment done where they are most comfortable…in your office. Increased case acceptance—patients follow-through with treatment more predictably with in-house services. Improved profitability—a portion of the treatment fee is retained by your practice rather than being referred away. Dr. Greene and his team help you deliver on these promises and have done so in hundreds of dental offices over the years. Our safe and efficient systems ensure that your patients continue to receive the level of expert care they are accustomed to receiving in your practice. Schedule patients for treatment, track your patients, and transfer personal health information securely through our exclusive V-Link software. Our cloud-based practice management system is simple to use and makes it easier than ever to work with us. Access to our proprietary system is FREE to all hosting offices. Contact Dr. Greene today for a demonstration. Contact Dr. Greene today to schedule a demonstration on how simple it can be to boost your production, create happier patients, and offer more services within your dental practice. 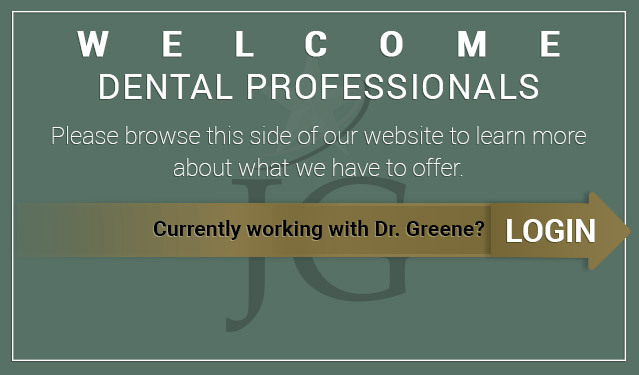 The best and quickest way to contact Dr. Greene is by email at jon@jgreenedds.com, or you can call him at (210) 860-2217.